The idea with this thread is for you guys to have a place to ask questions or give feedback on the proxmark3 rdv40. What about the FPC connector? You claim it can do BL? Well, it can do Serial over FPC, and the latest addon is using it. No more cables! How to compile RRG RDV40 repo for non-rdv4 devices? If you have problems, I strongly advice you take time to search on this forum for solutions first, then head over at GitHub and read issues both open and closed ones. If its a RDV40 hardware problem, post a new thread with this following information and a accurate description of where the hardware fails you. - Kali and Archlinux distros can't get a ttyACM, usually needs to kill their modem manager in order for the pm3 to enumerate properly. - Mixed firmware / client versions. Download & compile one repo and flash it. Use the shell scripts if RDV40 repo. Read the README.md or Wiki. If its about not knowing how to operate the pm3 client, try reading the help-texts. For LF, save a trace (data save) and upload for sharing. That helps out when trying to identify it. For HF, save tracelog via (rdv4) trace save and upload for sharing. Questions like "I can't hack xcy card", its just you, who don't know what you are doing. Go back and search the forum one more time. Repeat until you find your answer. Pretty many cards has topics here, if you can't find any, post in "unknown tags" category with a picture and eventual text found. Use your pm3 to gather as much information. O lord, the kickstarer is 87% in 48hours. We feel the community love! Steadily climbing! Cruising past 111% as I'm posting this. Thank you everyone for all that you've done to help make this possible! Congratulations guys! you have an awesome product and I can't wait to get my hands on it. Is there some information available (besides the pictures and FAQ on kickstarter)? Besides the kickstarter description, faq and pictures. no. Is it backwards compatible with existing PM3? Existing firmware runs on Rdv40? Same SOC, same FPGA? Schematic available? Backwards compatible with existing PM3? 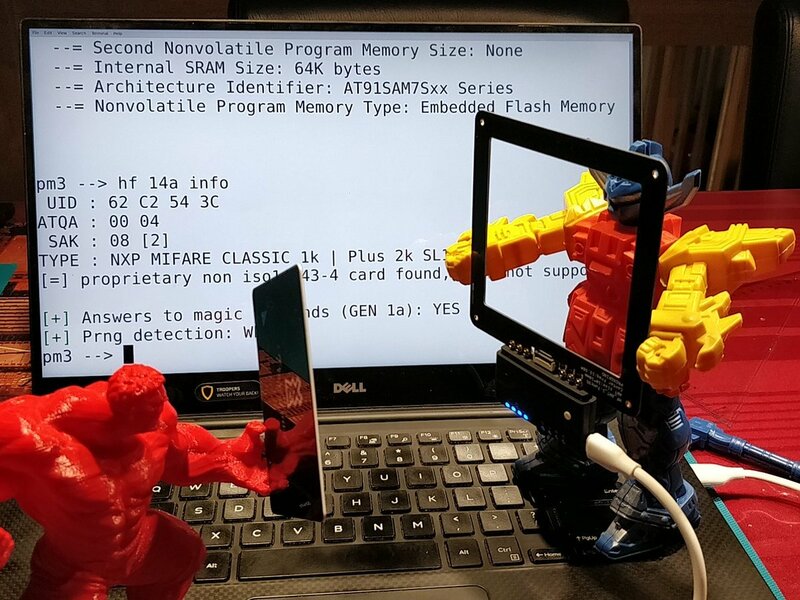 The official firmware runs on it, same fpga, same mcu, since the MCU has limited pins, previous unused pins in the firmware, has been taken to support the FPC connector and flashmem. Schematic not released. I have just missed the kickstarter campain, is there any possibility to participate nevertheless please ? Aouch, the kickstarter is closed as you noticed. However we are working with getting US/EU partners as we speak in order to get the rdv4 out on some webshops. You will be able to buy it there most likely end of the summer or beginning autumn. A sneak preview for the onboard flash memory support on client. We all back from fulfilling the VIP-pledge in ShenZhen, China, it was a great time meeting up with Garrett from Hackerware house! A short preview on how the new smart card commands works on pm3 client. The team had some discussions and we concluded since RDV40 runs offical pm3 repo but it will of course not run the new hardware features. There differenes are some changes like hw tune which will indicate the wrong values for antennas etc but to support the new features we would change code. We agreed not to convolute offical repo with our changes given the vaste number of older devices. It would make source code more complicated as it is and all we want is harmony in the community. All new features is found in iceman fork. The team will only work on RDV40 source code base from now on which lead us to create a new repo dedicated for RDV40. You find the links below, you can follow us but I haven't updated the repo yet. Share your love and dedication to proxmark3 and especially RDV40 by contributing to it. ....@doegox made a nice visual demostration of distances for RDV40 and the large antenna. Are you already writing a manual? like what the LEDs about? and some simple FAQs? The firmware uses leds very different within different commands. So no generic overview exists. There has been blogposts for some standalone modes that describes the led use within that standalone mode. Feel free to contribute. I'm having trouble guessing the use of the red & blue antennas. Event the kickstarter page is quite mutic on this.
" LF & HF antennas "
But they seem to ben exactly identical to the black one and holding both frequencies antennas. The blue and red antennas are the same as the black one. All of them comes in LF & HF. Same functionality just different color. The short answer is no. We are not planning on maintaining binary files. The reason for this is that there is many different OS's and configurations. Secondly the source code changes alot and the general recommendation of this forum is to run the latest source. Thirdly the RDV40 runs both offical repo and iceman fork. You will find that there is much information on this forum and on the proxmark3 wiki. Do take time to read it. Most common problems has already been asked and answered several times. The search button is your friend. First thing to do with your brand new RDV40? Your RDV40 comes with a modern icemanfork image which enables you to flash it with either latest offical repo or iceman fork normally. * Official Repo will cause overheating, since it is quite lax in turning off the antenna. Just try not to push the proxmark3 too hard under extreme condition. It happens on all revisions of the proxmark3 device. Where does this heat come from? The more antenna power, the more heat. That is some serious power levels. [+] Displaying LF tuning graph. Divisor 89 is 134khz, 95 is 125khz. This would explain possible overheating on rdv40 only. What about the other revisions? The observation states "It happens on all revisions of the proxmark3 device." I have no explanation as to why overheating happens on all revisions. My guess would be hardware design, hardware components used and software usage. The observation is made by proxgrind, who is way better at hardware than me. I ran the proposed test with running hf 15 reader and then simply wait and see. I "risked" both my Proxmarks at once: one PM3 with original board design and one PM3 with Elechouse RDV2. Both running current official firmware. Conclusion: There is no overheating risk at all with Orignal and Elechouse RDV2 boards (well, as long as you don't operate them in an oven). The statement above therefore must have been a misunderstanding? Please don't hijack theads. You already started one thread for this subject. 1. What is the current battery option for RDV4 to make it portable? 2. When will the large HF antenna be available for separate purchase? 1. Currently none, but the team is making a Bluetooth/battery addon as we speak. 2. You will need to ask the distributing webshops what they will offer. We have no saying in it. I would have appreciated if the plastic case would have provided better access to the smartcard connector and the JTAG pins through cutouts instead of having to open the case every time you need it. I'm considering using my Dremel now to do the cutouts myself, especially now that I soldered a connector on the JTAG pins to get easier access which prevents me from closing the case. Documentation about what can be done through the FPC? Even though iceman explained the rationale, I would have preferred to see the rdv40 mods (smartcard, FPC, external flash) merged into the main repository. The fork brings more risk about seeing the 2 repositories going out of sync at some point. i do agree that for the smartcard add-on the case should have had a small slot for the ribbon cable to come out (i just pinched it - we'll see how long before it breaks). I just got a Proxmark rdv 4.0 and am having some issues with it that I want to know where the best place to discuss them is. Is this the preferred place or is there one I have yet to find? Specifically I am playing with it using some a 1K card that I have and it seems to be unreliable reading it as compared to the RDV 2.0 card that I have been using. I am using the RDV 4.0 as it came out of the box and the RDV 2.0 is using code from the iceman repo. The couple of things that I have tried is to use hf search to identify the card. The 2.0 works all of the time and the 4.0 identifies the card less than 50% of the time. Then I try reading sector 0 with the known A key, "a0a1a2a3a4a5", and the 2.0 reads it every time and the 4.0 again less than half the time. Frankly, this is not what I expected, so I am looking for where best to seek out answers concerning this disparity and I haven't yet found an active discussion of rdv 4.0 issues, function or much of anything else. ..not a support thread, but if you start a thread do add the following information to it. This goes for all other who might read this post. When it comes to repos, don't mix firmware/client. See first post in this thread for RDV40 repo, HF is quite stable on it. Otherwise try the official pm3 repo. When it comes to mifare/14a, take notice about distance/positioning with tag and antenna. Find the sweet spot. Thanks marshmellow for porting it to the main repo! Actually better than a slot, I would have preferred a connector so that you can easily add or remove it when you don't need it without opening the case every time. But, as I think I forgot to mention it in my original message, considering that the case was not originally part of the Kickstarter, I do appreciate we have one It was a neat addition so hats off. Potentially you have the card too close to the reader. try putting a spacer of about 1 - 1.5cm between the top of plastic casing and the card. The major issue with case is not one of design but one of costs. It costs $10.000 to make a new mold. To keep costs low we reused the mold for Chameleon Mini RevE rebooted. I agree it would have been much more nicer with a slot for sim module extender and one for the fpc connector. We did opted for the flat cables just because of the limit with the case. It is still easy to cut out a slot in the case if you want to, or just squeeze it together. You also have an option not to use the case if you like the old style naked pcb way. Old proxmark3 devices, like RDV20, RDV30 easy and running the RRG Repo. The fixes for Serial over FPC and latest battery / BL addon is more or less done. The future is mobile. I have been looking forward to this day since back in 2013 when I started to platy with proxmark3.